I don’t believe in ghosts, but I’ve often speculated about others who may have stood behind the bar during the 160-year life of the venerable Union Saloon building, home to Carpe Vino now for more than a decade. On a mission to learn more, I’ve spent countless hours at the Placer County Museum’s Archive, bent over bound volumes of tattered, 19th century issues of the Placer Herald newspaper on a personal quest to unearth the history of our structure in Old Town Auburn. But every so-often, the past simply walks through the front door. 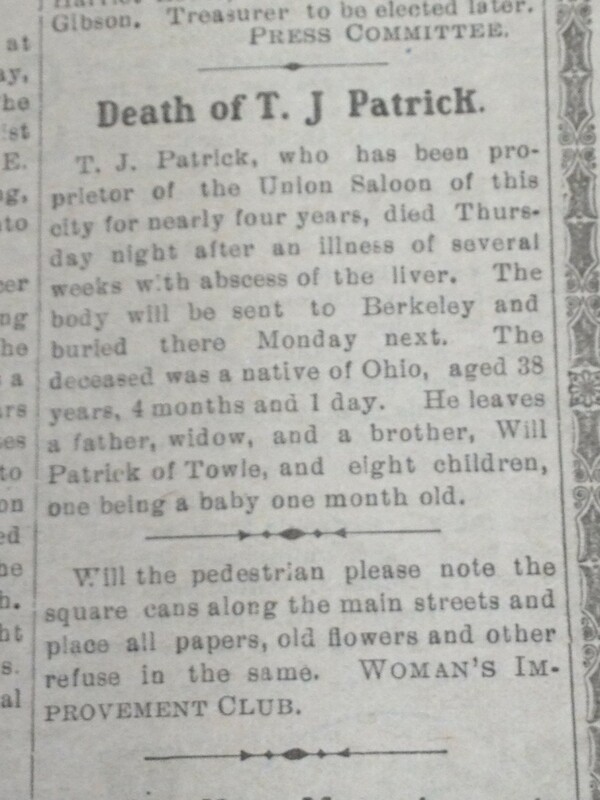 Thomas Patrick was a proprietor of the Union Saloon from 1908 until his death in 1912. 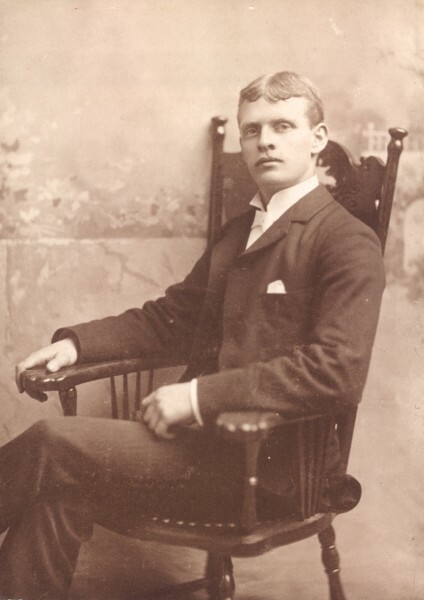 This photo was taken on his wedding day, February 5, 1895. Packaged with the letter was a sepia tone photo of Thomas Patrick. “I have enclosed a copy of his wedding picture, the only photo of him I have been able to find,” Doug wrote. I find this image haunting. It is a young man of about 21, sitting stiffly in a high-backed chair, grasping an arm with one hand, the other draped across a folded leg. He is nattily dressed for his special day, with starched wing collar and pocket square; his hair is neatly trimmed and parted down the middle. Yet there seems to be pervasive sadness in his eyes and not a glimmer of a smile. He is oblivious to the fact that he has just 17 years remaining in his all-too short life. 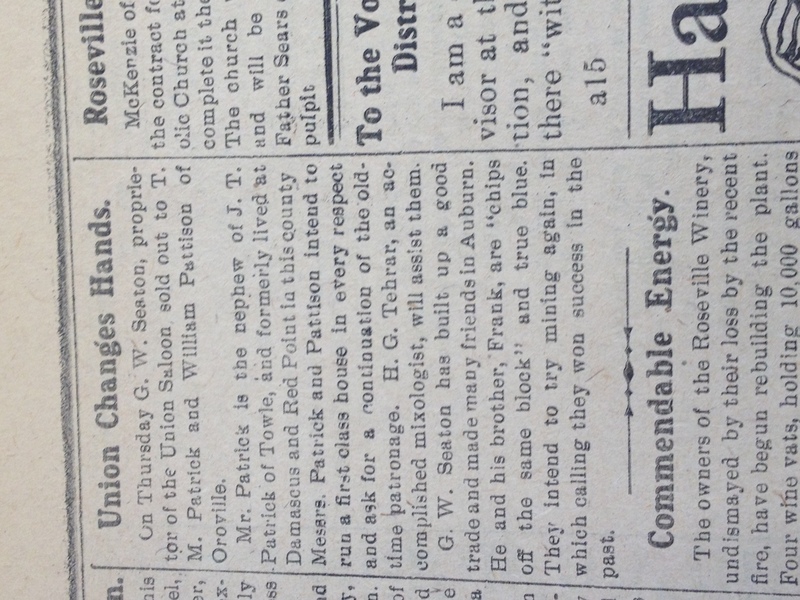 I feel an unusual kinship with Thomas Patrick, and not just because he preceded me as a steward of the Union Saloon. It is the look of him that I find so strikingly familiar, and I am not surprised to learn that his family emigrated from County Ayr, Scotland, in 1866. My ancestral clan’s origins spring from the same county—in the hamlet of Moffat. Records in the Placer County Archive indicate Thomas at one time lived in Damascus, near what is now Blue Canyon, about 38 miles east of Auburn. (In 1880, the population of Damascus was just 71 souls; today it is 0.) He was listed in the 1896 Great Register for Placer County as Thomas Meikle Patrick, occupation “woodchopper”. He was described as having a light complexion, gray eyes and gray hair; he could read, write and make his mark. “A very curious thing happened to Patrick during his terrible fall. He carried a sharp axe on his shoulder for use in cutting brush. During the plunge, the axe blade struck him on the shoulder, cutting through the clothing and making a slight wound. It then glanced and struck his mule, literally cutting its brains out and killing it instantly.” Click here to read the full story. 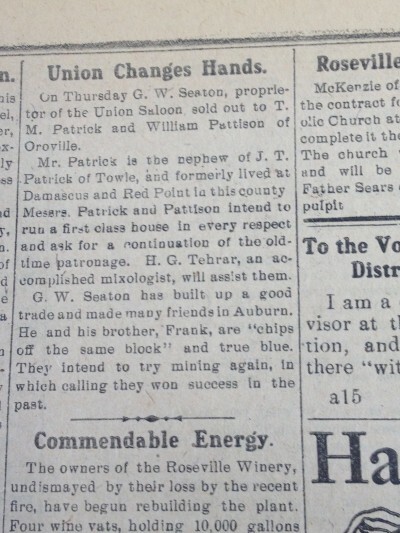 Just a few weeks later, on February 5, 1895, Patrick would be wed to Mary Sullivan. Other than two newspaper stories in the Placer Herald—one about his acquisition of the Union Saloon, the other his obituary—his family is the main source of information about Thomas. 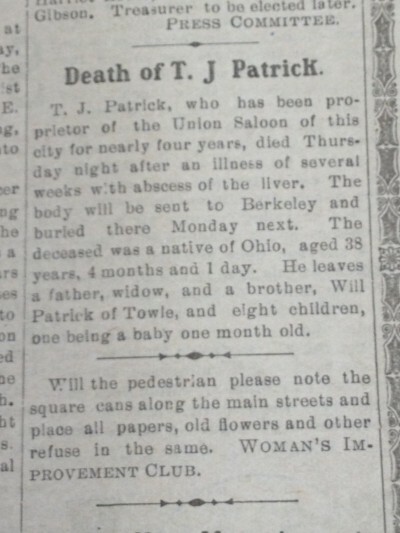 The Placer Herald reported that Thomas, who was “aged 38 years, 4 months and 1 day,” passed away on June 6, 1912, “after an illness of several weeks with abscess of the liver.” This cause of death differs from the family’s records, but 100 years later, our local paper—the Auburn Journal—still has a difficult time getting the facts right. Thomas was a brand new father at the time of his death; a daughter, Bernice, who was “aged one month and 17 days.” The seven other children—aged 15 to 2 years old—comprised four boys and three girls, including Doug’s father, Raymond. Leaving behind a large family was bad enough, but Thomas’ Union Saloon was deeply in debt, according to court records related to disposition of his estate. Court documents filed on June 24, 1912, indicate Thomas “died Intestate”; he left no will so the court appointed Mary “administratrix” of his estate. . ., which, unfortunately, did not amount to much. His assets totaled just $1,470, matched against debts of $3,611. He owed $318 to A.W. Kenison Co., a cigar maker in Lower Town and $2,000 to his uncle, George Patrick of Maricopia, Kern Co. (a huge sum of money in that era). 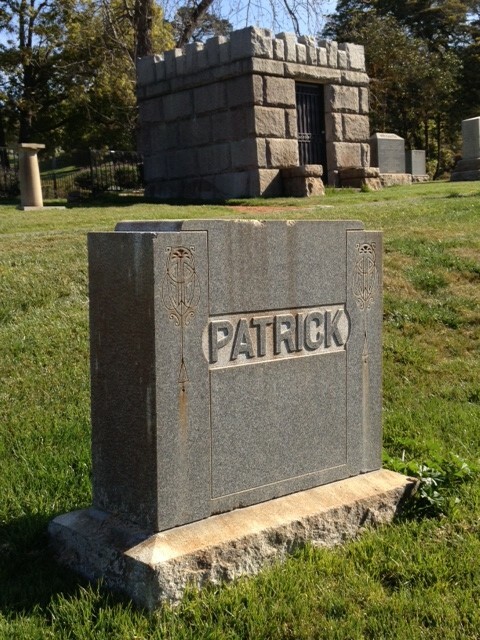 Thomas M. Patrick is buried in Sunset View Cemetery, El Cerrito, CA. After his death in June 1912, Thomas Patrick’s body was sent to Berkeley for eventual internment in what is now the Sunset View Cemetery in El Cerrito, a beautiful spot on a hill overlooking the San Francisco Bay. He is buried in this family plot with five other family members, including his father, William. Auburn is loaded with historic structures—in both Downtown and Old Town—and the specific uses of most have changed dramatically over the years. There is an ebb and flow of businesses; merchants come and go, and their identities are mostly lost in the dust of decades gone by. With a few exceptions, most people operating businesses in Auburn today have precious little understanding of who toiled before them. So it was very exciting for me to learn about young Thomas Patrick and his experiences in the foothills and Lower Town. His life before acquiring the Union Saloon seemed hardscrabble enough, and it appears that without the largess of his uncle, he would have missed the opportunity to run his own business. We struggled for years to keep Carpe Vino afloat before we hit on a business model that worked, so I can only imagine how difficult it was for Thomas Patrick to survive selling beer, whiskey and cigars. I’m certain the hours were murderous and profitability was elusive. . .something that hasn’t change during the intervening century. Carpe Vino has developed into a solid business, and that gives me great satisfaction. But learning about Thomas Patrick makes me appreciate our larger responsibility of ensuring the survivability of the Union Saloon’s infrastructure as well as its traditions of hospitality. And this is something my partner and son, Drew, understands completely. My thanks to Doug Patrick for taking the time to stop by Carpe Vino and share his story. He has created an important link to Carpe Vino’s predecessors and helped us celebrate what happened in our building more than 100 years ago.